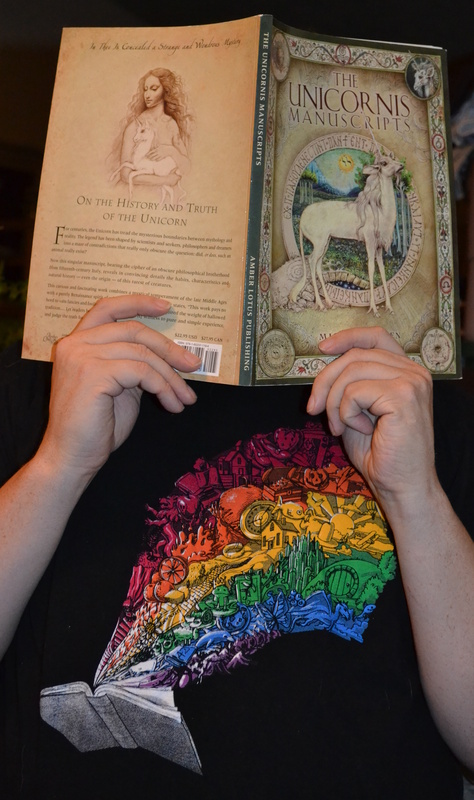 If a shirt has books and rainbows, there is a high chance I will love it. I have been staring at this shirt, trying to figure out what exactly to talk about. There is so much in there. I see a hobbit door, which makes me think of the new movie coming out. There’s a pumpkin, and I am off thinking about Nightmare Before Christmas, which makes me think of Tim Burton. Then I’m thinking of The Corpse Bride and Johnny Depp, which makes me think of pirates, which makes me think of Keira Knightley, which makes me think of Love, Actually, which leads me to Christmas, and wondering when we will get our large tree up and decorated! This endless meandering generally applies when I think of great literature, too. There are so many wonderful choices of books to read today! We picked up The Unicornis Manuscripts at our local organic food grocery store, of all places! Here’s an interview with the author, Michael Green. The book is so pretty and interesting to read. It reminded us of Lady Cottington’s Pressed Fairy Book by Terry Jones. Which makes us start quoting Monty Python at each other… Would you like a mint? It’s wafer thin! Ni! I’m not dead yet! My hovercraft is full of eels! The department of silly walks! I came here for an argument! No, you didn’t, you came here for an argument! This is an ex-parrot! You can see how things go at our house.